we've got a new piece up at arrow factory. Euan Macdonald has made an effervescent night light installation for the rooftop. if you happen to be wandering around after it gets dark, swing by and soak up some of the glow. Arrow Factory is pleased to present a light installation by Los Angeles artist Euan Macdonald. Taking a cue from the abundant LED lights that line skyscrapers, office buildings, and highway underpasses throughout Chinese cities, Macdonald has chosen to illuminate the space atop Arrow Factory with gleaming blue lights that radiate upwards into the sky. With this, an isolated and insignificant corner of the city is mysteriously accentuated and embellished. 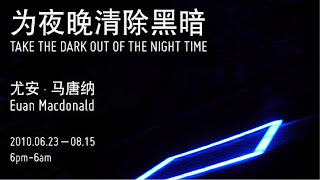 Macdonald’s gesture—transplanting the visual language of glitzy, brightly colored lights that adorn contemporary architecture onto the low-rise neighborhood of Jianchang Hutong—might appear resoundingly formal but is imbued with the artist’s continuing interest in inventing, capturing, and recreating the enigmatic and inexplicable phenomena of our lives. The title Take the Dark Out of the Night Time not only alludes to the mystical qualities of light and time but proposes an action that is neither fully rational nor achievable. Take the Dark Out of the Night Time is viewable seven days a week from dusk to dawn. A small artist’s book will be published in conjunction with Take the Dark Out of the Night Time.